Our story began a little over 12 years ago when we met in high school. We attended different schools, but they were just minutes down the street from one another. Adam’s highschool often held monthly dances, which is where we officially met. Although, a funny little side note is that we had connected online first through “MySpace” (our friends will never let us live this down lol!). It was the best thing that could’ve happened because our chemistry was instant and we’ve been inseparable ever since! The Proposal! During the last week of completing my fieldwork to finish off my Master’s Degree, Adam had a little something up his sleeve and planned a night out in NYC. After enjoying a candlelit dinner at Tavern on the Green, we went for a walk and Adam looked so sweet as he got on one knee and finally popped the question in Central Park! The surprises didn’t end there though; some of our closest friends and family were waiting to celebrate with us at a bar nearby! It was an amazing night. Why did you pick your venue? 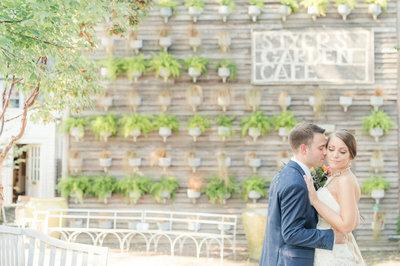 We knew the Ryland Inn was our venue the moment we pulled up. Their grand ballroom is the perfect mix of charm and elegance, and felt more like “us” than any of the other venues we had visited. We absolutely fell in love with those beautiful grand doors and windows, and when it came down to it, we couldn’t envision our wedding day anywhere else. The Ryland Inn, along with their staff, was everything and more! There are so many favorite moments, it’s hard to choose just one. The entire day was filled with endless smiles and lots of emotions from our first look, to walking down the aisle with my dad, saying our own vows, our moms linking hands with the biggest smiles after our unity candle ceremony, and the thoughtful toasts. Aside from all of those moments, along with spending one of the best days of our lives surrounded by our closest friends and family, we would have to say our first dance was truly memorable. We actually choreographed it ourselves with the help of YouTube (lol!) and had an absolute blast showing it off in front of our guests. We occasionally catch ourselves reliving that moment in our kitchen anytime Michael Buble’s “Everything” comes on. After our first dance, we were able to let loose and enjoy the rest of the night dancing and celebrating with all of our guests. Where do I start? Our wedding day felt like an absolute dream! 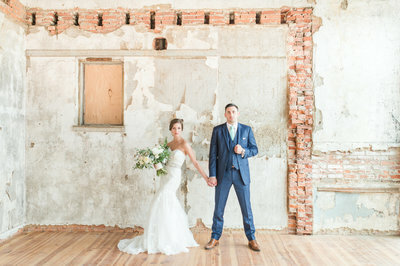 We wanted each aspect of our ceremony and reception to feel elegant, romantic, and intimate, while keeping things simple and true to who we are as a couple. Our details included the colors of blush and burgundy for the romance factor and then gold and navy for an elegant yet charming touch, with lots of florals throughout. We incorporated our love for travel with a “bucket list” guest book, display of photos with an “adventure” album, and a vintage wicker suitcase for our card box. The grand ballroom of the Ryland Inn already exudes a very elegant and romantic vibe all on its own, so we decided on simple details that felt inviting and would compliment the already beautiful ambience of the room. We chose low floral centerpieces and garland with hurricane and gold mercury candles for our tables, along with fresh florals for our cake. The added touch of freshly lit candles and greenery in the fireplace made the room feel that much more romantic and inviting. We spent our honeymoon in Greece and traveled to Santorini, Mykonos, and Athens. It was the perfect blend of romance, relaxation, culture and adventure! 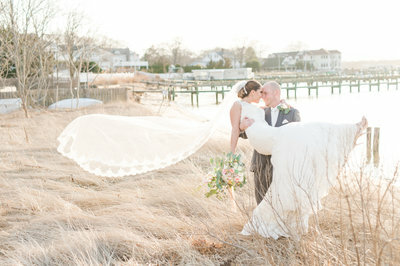 Love this Ryland Inn wedding? PIN the image below or any of the pictures in this post!